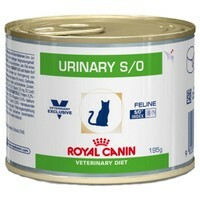 Royal Canin Urinary S/O Tins for Cats is a nutritionally balanced veterinary diet for cats with Feline Idiopathic Cystitis, and to treat kidney stones and bladder problems. Designed to help with the dissolution of struvite uroliths and to decrease the acidic pH value of your cat’s urine, Royal Canin Urinary Vet Diet has been carefully formulated to reduce the risk of recurrent struvite and calcium oxalate urolithiasis. Idiopathic Cystitis: The high moisture content of Urinary S/O Tins increase urine dilution and help avoid recurrent cystitis.